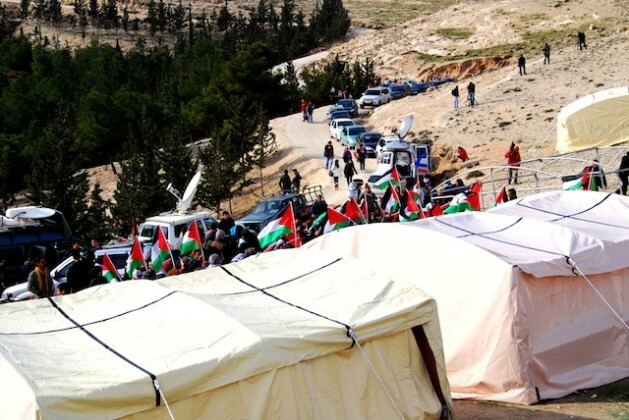 Bab Al-Shams, the first tent encampment erected by Palestinian activists. Credit: Andreas Hackl/IPS. JERUSALEM, Apr 13 2013 (IPS) - Tent cities are being set up by Palestinians all over the West Bank to protest against Israeli settlements, building on a protest during the visit of U.S. President Barack Obama last month. Holding signs reading ‘Obama: you are on the wrong side of history’ and ‘Obama: you promised hope and change – you gave us colonies and apartheid’, dozens of Palestinian activists set up tents on a hillside just outside of Jerusalem during Obama’s first official visit to Israel last month. The tent village aimed to draw international attention to continued Israeli settlement building, and to unwavering U.S. support for Israeli policies. It was established in an area of the West Bank known as E-1, where Israel plans to expand the settlement of Ma’ale Adumim settlement. Hundreds of Palestinian activists built the first tent encampment called Bab Al-Shams, literally ‘Gate of the Sun’, on privately owned Palestinian land in the E-1 corridor in January. Despite being violently dispersed by Israeli police and soldiers a few days after it was established, Bab Al-Shams inspired the building of even more tent villages throughout the West Bank. The author of ‘Popular Resistance in Palestine’, Qumsiyeh told IPS that the idea behind the tent villages builds on decades of Palestinian steadfastness in resisting Israeli efforts to displace them from their lands. “It’s not a new phenomenon,” Qumsiyeh said. According to Abdallah Abu Rahmah, a leader in the West Bank village Bil’in, which has held weekly demonstrations against the Israeli wall and settlements for eight years, the tent encampments represent a new strategy in Palestinian non-violent resistance. “We try to use creative ideas and new ideas. We try to build our tents, using this type of non-violent resistance, to stop the plans of the Israelis of building settlements,” Abu Rahmah, who helped build several of the tent villages, told IPS. "The fact that they stayed is a form of resistance." Dena Qaddumi is an architect, and co-founder of arenaofspeculation.org, a website dedicated to exploring spatial resistance in Israel-Palestine. She told IPS that the tent encampments signal a less reactionary form of Palestinian resistance, especially since they sparked critical discussions both locally and internationally. She said that uniting Palestinians across physical space – Israel bars Palestinians from the West Bank from going to the Gaza Strip, and vice-versa, for example – is something Palestinians must address. While I understand completely why there is a protest on the part of Palestinians, I am fearful for them as a people because there is already so much unrest in that region. I am not a scholar who has an extensive hands on education about the land in that region, I am only a woman of God who believes God’s word to be truth and to share that truth and walk in the way of that truth. I have viewed the map of Israel, Gaza, West Bank, and Golan Heights. Issac was not the only son who received the promise from Abraham as given by God. Ishmael was also a son who received a promise that he would be father to many. And so I say, the West Bank does not border Gaza. Gaza’s HAMAS leadership should be looking at acceptable land that would tie into Gaza’s border. Then if Gaza believes the land is right for their purpose (including expansion for future settlements and people) they should go to the high court and fight for it. I am behind Gaza having what is rightfully hers. I don’t know of any Christian who would dare see Gaza denied land promised to her people.